The 30-hour* Ultrasonic Cool Mist Humidifier guards against problems caused by dry air in the home. It features an easy to fill .5 gallon tank, ideal for use in small sized rooms. Unlike other humidifiers that grow slimy mold on the water tank surface, Silver Clean? Protection is embedded in the tank to fight the growth of mold and mildew on the surface of the water tank. Thanks to ultrasonic technology, it disperses a fine mist into the air, and is ultra-quiet making it ideal to have on while you sleep. The humidifier emits a soothing cool mist, and a low water indicator light lets you know when it?s time to refill the water tank. Night light feature makes it a great addition to kids? rooms. PureGuardian? humidifiers create a better home environment for those suffering from colds, allergies and dry skin. Note: Run time is based off of running the unit on low speed, also depends on atmospheric conditions. I really like this product. It is everything I have wanted in a humidifier. It is easy to set up, easy to fill. The water reserve has an easy open cap that allows you to fill it. It doesn't leak very much at all when you turn it up right to place it on the base and it fits easily on the base. It has a night light in the base that lights up the water reserve, which is perfect for a child's room or an elderly person whom you need or want to keep an eye on. The night light is also optional, you don't have to use it. The humidifier has three settings. You push the on button on the front and it turns it on low, push again you are on medium and a third time your on high. The fourth time will turn it off. It gives off a soft mist out the top which you can position so the mist sprays which every way you want it to blow. Now the three settings is where the misleading part comes in. The box and instructions state this is a .5 gallon humidifier and that it will last 30 hours. That is not necessarily true. It likely will last 30 hours if you place it on the low setting. However, if you put it on the high setting, which is what I prefer, it won't even last the night. I turned it on at 10:30pm on high. I woke up at 4 am and the power light, which is green when the humidifier is running, was red, indicating it had run out of water and shut itself off. I still would recommend this as it is a good product, but if you want it to last all night you will have to leave it on low. 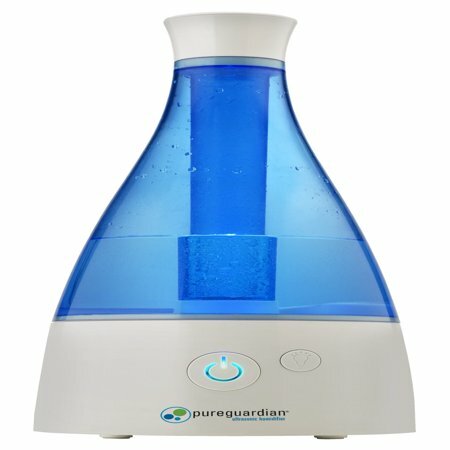 The Pure Guardian H940 30-Hour Ultrasonic Cool Mist Humidifier, .5 Gallon is really nice. It's small, it stands about 2foot tall so it can sit on a night stand or end table or anyplace where there isn't much room without any problem. It has a white base with a white cap and the middle you can see thru is blue. It has 3 speeds, low medium and high. Low is a real waste of time actually in my opinion I only use high and that to me is slow. It has a night lite and an auto shut off. They say it has a fill time of 30 hours of use but I totally disagree with that. Just for the sake of writing this review I put it on low and it ran out of water in 22 hours so I didn't even bother with the medium setting for the time. On high it runs out in 8 hours. To fill it, you just tip the middle over and unscrew the cap and fill it with tap water and put the lid back on and set it back in the base. It really is nice. It's not good for a medium or large room but for a small bedroom, office, or whatever small room you have it is very nice plus it has a night light in it. I have a small living room so that's where I use it and I am very happy with it even if I do have to fill it every 8 hours or so but to use it at night you can use it on high in a bedroom before bed then when your ready for bed fill it again then set it on medium or low and it will go all night long without running out of water and shutting off while keeping moisture in the air since you ran it on high before you went to bed. In the past I had used a humidifier that heated the water and produced a steam mist in order to raise the humidity. There was a wait time to get steam since it had to heat the water first. With this puregardian humidifier, ultrasonic technology is used to produce the water vapor. This means that you have instant water vapor. As soon as I turned the unit on, it immediately began producing mist. There are three settings: low, medium, and high. You just push the power button once to turn the unit on and get low mist. Push it again to get medium. Push it again to get high. Unfortunately there is no indication as to what setting you are on, though you can tell by the amount of mist being generated. The tank is coated with something called Silver Clean Protection which is designed to inhibit mold and mildew buildup. With my heated humidifier, I had to treat the water container with a bleach/water solution every week or two, or otherwise I got a weird odor from the unit. They claim a 30 hour run time using the low setting. I always take these ratings with a grain of salt. A nice touch is the night light, which illuminates the unit with a blue glow – that looks cool. It runs very quite. This unit is designed for small rooms. For my test of the unit, I put it in a room about 12 x 10 feet. I placed my temp/humidity gauge on the other side of the room from the dehumidifier. I had the measuring gauge placed about four feet high. My starting humidity was 45%. After about one hour of run time on the low setting, the humidity rose about 6%. I then ran the unit on high for another 30 minutes. The humidity rose 7% in that half hour. When I finished the testing, the humidity in the room was at 58%. Normally I would not use a humidifier at this humidity level, but I did so because I wanted to test the device's performance. If your humidity is fairly low (less than 20%), I would recommend running it on the medium or high setting. The down side to the cool mist produced by this unit, as opposed to a unit that heated the water, is that the mist tends to drop towards the floor; however, the unit does manage to propel the mist, on high, about 18 to 20 inches into the air. This would recommend placing the unit somewhere high off the floor. So then, the unit managed to produce a significant increase in humidity in a reasonable amount of time for the size of the room, and it was very quiet. It has an esthetic appeal as well. I'm satisfied. This product is plastic & has 3 different parts, a base with power cord, a water tank & lid on top for mist. The color is white & blue which I like. I have a bigger one of same color & this is best for smaller kids room. Also the mist can be set on low, medium or high which is cool. The water tank can fill 0.5 gallon which is good & easy to carry. First I thought this was small to use overnight but I tried to keep it from 8.30pm to 8.30am on low mist setting & surprisingly worked excellent. There was still water remaining too. The product claims to switch off automatically as water gets low in tank which is amazing. This claims to have ultrasonic technology & is ultra quite which is very true. Also it gives out fine mist & makes breathing so good at night. The product also claims to have silver clean protection to fight growth of mold in tank. We get hard water here & as recommended I used distilled water. Also on the package, it suggests extra cartridge to be brought separately if using with hard water which I have not tried as I am not using the hard water but good to know there is an option. This also has night light option which is cool if want to use. I have been using this more than a week now and very impressed with this one & like everything about it. My child had cold & some dry cough & while I am using this at night she has being having a calm sleep. A good remedy for breathing well at night when low humidity inside or while using a heater in winter. I have had a big humidifier which would take more water but now I prefer this one as this is best for overnight use & not bulky for me to fill in water everyday. I definitely would recommend this for kids room or as an extra for any room at home to use for having good humidity & best night sleep. Works great and does not need a filter! We selected the Pureguardian Ultrasonic Humidifier to try out a filterless one. We normally use a vaporizer year round and one of the biggest drawbacks is having to clean and change the filters. This is the first filterless one we have tried. We had heard from other ultrasonic users that these types of vaporizers have a tendency to leave a white film all over. We have used the vaporizer for several weeks now and there is no film left at all. The tank capacity is .5 gallons and the directions state it gives up to approximately 30 hours of successive humidity hours between tank refills which we questioned. The vaporizer has 3 speeds and we found that when used on high it does go through most of the water in an overnight period (9 – 10 hours). Maybe if used on the low setting it would last up to the 30 hours but we are used to filling vaporizers every night so this really isn't a problem. It is also very quiet, you can barely tell when it is on. There is a very bright blue light that illuminates through the water container that makes a great nightlight if needed. This can be turned off if not wanted. We love not having the filter, anyone who has used these knows how disgusting they can get and obviously cannot be healthy when they start to build up. We love this vaporizer and plan on getting another one for the other bedroom. Highly recommended! This humidifier is a unique product in my experience. Up to this point I have been using a vaporizer. The vaporizer works too, but less efficient. The water tank is about the same size, but it takes a lot longer for the water to be used up. I am leaning toward faster being a good thing. I like the cool mist feature. That allows the unit to begin putting moisture in the air immediately when it is turned on. I believe that makes the PureGuardian less expensive to run as well. A unit that requires the water to be heated takes more time to begin misting as well as more electricity to heat the water. Though I expect the difference is miniscule. The instruction manual is easy to understand and seems complete. The cleaning instructions are particularly useful. I have not had to clean the unit yet but expect it will be easy to accomplish and require little effort. The unit should last for many years with proper cleaning and off season storage. I interpret the "30-hour" in the title to mean one tank of water should continue misting for 30 hours. I do not find that to be the case. Even on the lowest setting, the water is used up in considerably less time than 30 hours. I don't believe the unit has a moisture sensor, so it is up to me to decide when there is enough moisture in the air. While I need a certain amount of moisture in the air for several reasons, too much moisture effects me poorly. I don't see a fill level marker on the tank, so it is a trial and error system for the optimum fill level. I did over fill the tank once and have not yet found the optimal level. I have been using the PureGuardian unit for about 2 weeks now. so I should be able to make that determination soon. Over all I am very pleased with the unit. In my experience, it outshines the other air-moisturizing alternatives on the market. I would recommend it to anyone. The sleek design fits in tight spaces. It's easy to fill and use. Mist lasts a very long time- a full day and night. The mist is very cool so I bundle-up near it, but I feel my nasal passages softening after just a couple of hours. My dry skin seems to like it too. It's basically silent- love that. It pushes the mist about 2' out of the top before it starts to drop, and you can angle the mist wherever you want. The nightlight is nice for children. It's an up-light through the water reservoir- very pretty. Only things I would change are 1- Really wish the power cord could be removed from the base so could keep the cord plugged in the wall while cleaning the base. It's not so easy to reach many wall outlets. 2- Wish it had an auto-shutoff timer because it's so quiet I forget it's on when I leave the room! It's easy enough to clean with the small included brush and a baby bottle brush, and it has an anti-microbial coating to help keep algae and mold production down. There is a convenient holder for the cleaning brush inside the base so as not to lose it. Guardian Technologies “pureguardian” Ultrasonic Humidifier If you are looking for a small room humidifier this one does the job. Although I have a whole house humidifier I was looking for a small one for the bedroom and was happy to test this one. This is the perfect size for a smaller room aesthetically this is a very nice looking unit. Fits perfect on the nightstand. It is easy to fill but the shape is a little awkward to handle when filling. The mist director is great, just point to the direction you would like the cool mist to flow. There are 3 settings low, med and high. The unit holds a half gallon of water so on the lowest setting the water should last up to 30 hours. I have been running mine on med or high and I have to say this is the quietest humidifier I have ever owned. You seriously forget it is on, but that's ok because if it runs out of water the power button should go red and shut off the unit. This also has a night light that looks very cool in the water if you chose to use it. I sleep so much better having this running and the humidity gauge in my home shows “best” humidity when the humidifier is on. It is recommended that the unit be cleaned a minimum of every two weeks. If you have hard water it is recommended to use distilled water. Perfect size, very quiet and does the job, does it get any better. Thumbs up for this one. I got the Pureguardian .5 gallon 30 hour ultrasonic humidifier H940 to see if I could put moisture in the air during the time when the furnace will be on as I live in an old house with dry air. The shape reminds me of a wine bottle so that might help a few souls sleep better. As this is my first humidifier I expected a lot of noise but this machine was pretty quiet. The mist was not a stream but a fine cool mist that started right away so there was no waiting to “warm” up the machine. The Silver Clean protection is to fight mold and mildew on the surface of the water tank. That is a comfort to know. This humidifier has a mist nozzle you can point in different directions (which is a plus depending on where you place the humidifier), an on/off night light control (great for the kids room), a refill light indicator, auto shut off when empty (for those of us not paying attention), about 16 inches high, and runs up to 30 hours. Make very sure you read the use and care manual as it will tell you how to clean the humidifier and do's and don'ts. I decided to include a picture of the box so that you can get a better idea of the features of this machine. A friend of mine suggest using it all year long.